We are the BEST Bounce House and Water Slide rental company in the Tampa Bay area SERVING ALL OF HILLSBOROUGH, PINELLAS, AND PASCO COUNTIES. Take it from our many wonderful repeat customers we service - Over 150 Churches, Schools (both public and private), Corporate events, Businesses, Martial Arts Centers, Day Care Centers, Festivals, and countless happy backyard home party rentals. We are Tampa Bay's Event Rental Specialists! Check our 5 Star Ratings in both Google and Facebook! 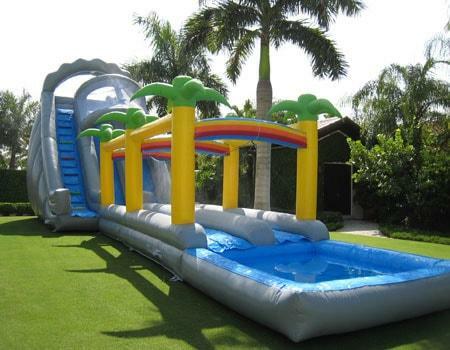 Browse over 200 HUGE slides, bounce houses, combos, MASSIVE obstacle courses, and inflatable sports games all for rent in Hillsborough, Pasco, and Pinellas counties. Safety - Reliability - Experience - Professionalism - and THE BEST VALUE in Tampa Bay. Rent from Bounce A Lot! Our service record and employees are rated "FIVE STARS EXCELLENT" in online reviews. We are VERY proud of this! We can go to any park, school, or facility in the entire Tampa Bay area! Before EVERY rental all our equipment is completely cleaned in a 3 step process and then SANITIZED with an ECOLAB hospital grade sanitizer! 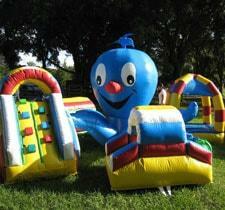 Our inflatables are professionally serviced and always VERY well maintained. Why take chances when it comes to your special event? When it comes to the kids at your event you shouldn't be making decisions based on saving a few bucks. Rent from the PROS and experience the VALUE, SERVICE, RELIABILITY, SAFETY, and our SUPERIOR EQUIPMENT at Bounce A Lot Inflatables! 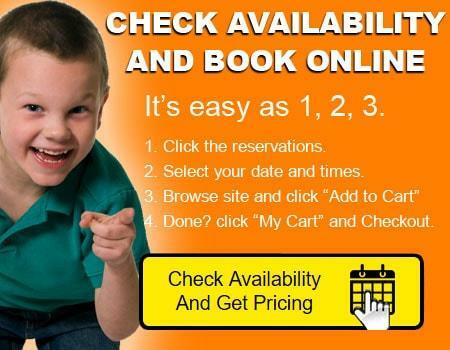 Booking your rental reservation online has never been easier. FIRST click the BIG FLASHING "Online Reservations" button at the top of every web page and enter your event date and times. You will then be presented with a categories page that is now LIVE for your event date. As you browse all the exciting attractions and equipment, you will only be presented with items that are available on your event day. When you see an item you want to rent, if it's picture is in color, just click on that item then the "Add to Cart" button and begin building your shopping cart for checkout. (Items in black and white that say "sold out" are already booked). Once you start your shopping cart, you can continue to browse through our online store by clicking the "Continue Shopping" button. Want to see what's in your cart? You can always check on what's in your cart at anytime by clicking the "My Cart" button at the top of every page. Reservations on BouncealotInflatables.com site is truly easy as one, two, three! Experience the Bounce A Lot difference. We're ready when you are! Bounce A Lot Tampa has the best selection of the biggest, baddest water slides in the area. Like the Kong 28ft water slide with pool shown on the left. These giant water slide rentals make great centerpiece attractions for any event. We have a variety of themes and sizes that are sure to fit your event atmosphere and space allocations. If you have questions about which slide is best for your event, just give us a call. We're ready to help. We have slides that are age appropriate and those that are great for all ages. Like our Awesome "Jaws" slide. 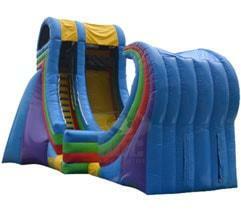 This water slide is 22ft tall and makes a monster statement at your event. The pool is designed as a motor boat with a biten taken out it. Perfect for a big party or church event. These slides are big, so make sure to check your available space, guest age group, and if a water source is available. Get ready for a wet & wild time! See What's Hot at Bounce A Lot! 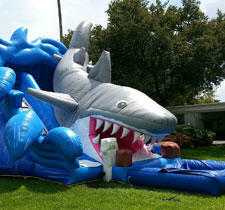 Having the best water slide rentals in the Tampa Bay area is our specialty! 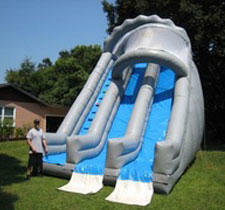 We have the biggest, baddest water slides around, as well as more compact slides that can fit any backyard party. You just add a little water and get ready for fun! 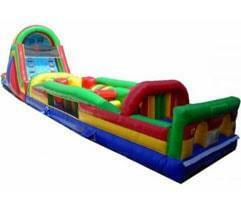 When you rent a bounce & slide combo from Bounce A lot Inflatables, you get the best of both worlds. More fun and great value. Combos get their name from being a "combination" of the bouncer and extra features. Make sure you book your combo correctly too - WET or DRY! You can't go wrong when you rent Americ's favorite attraction, the "Bounce House"! 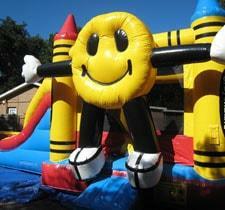 Known as moonwalks, jumpers, bouncers, moon jumps, and space jumps, these awesome inflatables will entertain your guests for hours. Units are always cleaned and sanitized. See our complete line up or different themes and characters! 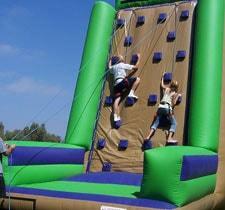 Obstacle Courses are a great way to bring your guests together in the spirit of fun and friendly competition. 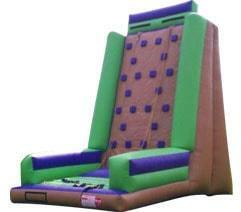 Perfect for school fun days, church groups, even as corporate team building events. Bounce A Lot has just the right challenge course for your event and the largest courses and biggest selection of obstacle courses in the Tampa Bay area! Challenge, skill, and a little "uh-oh, scared of heights! 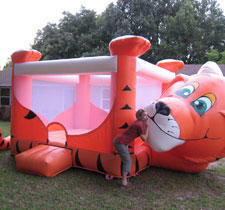 ", are all encompassing features of our unique interactive units & inflatable sports games. 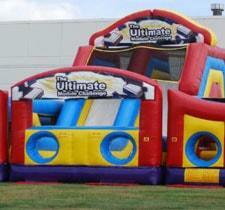 Choose from large centerpiece attractions like our 25ft inflatable climbing wall, or the Human Foosball game. Great for all ages! These cousins to our water slide units are every bit as exciting, and are perfect for locations where water use is not appropriate. Great for indoor school fun days and church fundraising efforts. Bounce A lot has a great selection and you can see them all here! Designed with the smallest of your guests in mind, our toddler inflatables have safety features that protect children while at the same time open eyes to excitement with bright colors and friendly characters.These units are best for ages 6 years old and under. 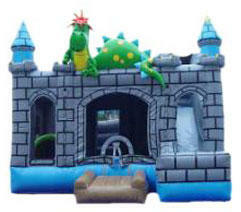 See our unique assortment of special tollder inflatables here. Here's your chance to have a classic, all-american, attraction at your next event. Just get your local "Big Cheese" up in the hot seat and watch folks line up to get their chance to give'em the big slash! Multiple styles to choose from from the classic Dunk Tank to the NEW Big Splash upside down dunk tank. Get details now! 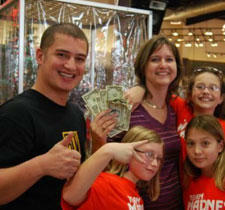 First developed for a vintage TV game show, the Cash Cube "Blizzard of Bucks" has quickly become a favorite attraction. 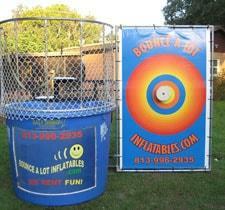 Great for church and corporate events, just set it up and everyone will want to take a shot at the big bucks grab. Make sure everyone gets a seat at the table for your next party or celebration with table and chair rentals from Bounce A Lot! We even offer FULL SIZE picnic table rentals. Whether you need complete seating configurations, food service banquet tables, or kid size seating and tables, we've got you covered! You can't go wrong with a "Fun Food" concession. 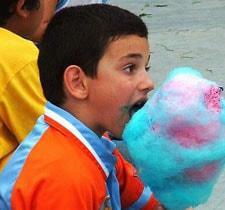 Church bake sales, school spirit fundraisers, and even a backyard birthday parties, are just a bit more fun with fresh popcorn, sno-cones, and cotton candy. We now have Hot Dog Steamers too! Supplies included as indicated. Here you'll find all the cool stuff you might not have thought of. 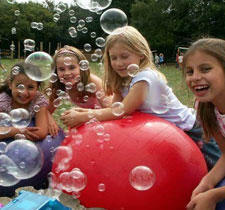 Bubble machines, games, Sky Dancers and so much more. How about a 6ft birthday cake on the front lawn marking the location of the big party? Giant Soccer Darts, Speed Pitch Radar, Free Throw Challenge, classic carnival games, see them all here! Paul & Patricia - Thank you so much for working with us. Jesse was awesome! Our event went great and I can’t brag about you all enough. I will tell everyone about you and I look forward to working with you again. Thank you Paul for all your help with our Bounce house for our event yesterday! Our team and their families had a great time and Jessie was a pleasure to work with! Thank you again! Second year working with them. Great communicators, on time with delivery and pickup and high quality slides and accompanying items. We added a snow cone machine this year and it was a HUGE hit w/ the kids! Will continue to use them for our inflatables needs! Bounce A Lot Inflatables went so above and beyond for my little girl's birthday party--I was really touched by their commitment to making sure her day was special. 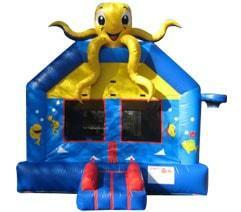 I just ordered a purple castle bounce house. 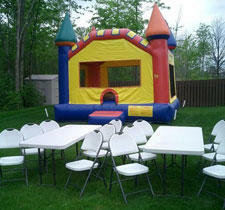 I have rented several bouncers, slides and combos from them, great prices, always clean and on time, friendly service. Kids love the slides and we usually get one for adults too! Sports bouncers are always fun. This company has great equipment for all ages & occasions. They are very customer oriented & keep you informed about your delivery times, space required, even power necessary to support their equipment. Wonderful to work with to create a great experience. Quality,Selection and service the best of Tampa and surrounding areas. 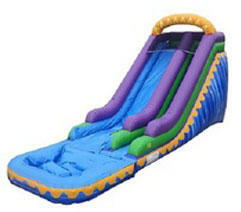 We have rented water slides,bouncers and recreational units. Best family fun money can buy! Best selection, great service, clean equipment, on time, and get the 1/2 pipe! Thanks for all your help & guidance pre-order. Made our event, so much fun! Thank you for the great service and for a fun product. It was a pleasure doing business with you and your company. You all were so easy to work with!